Follow the battle of a lifetime as Piranha-Man and Werewolf-Man fight for the very first time. Two of natures fiercest killing machines fight through rivalries, family and brutal murder. There can only be one winner. Investigative reporter Lexi Glass (Carrie Long) believes she is following a story that could make her career. Beautiful blonde haired women are being murdered by an unknown assailant the only clue is that people hear what could be a wolf howl when the murders take place. Lexi soon meets the murderer but it is hardly something she can write about. 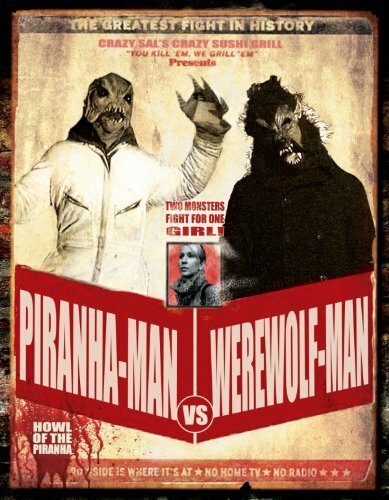 A Werewolf-Man is committing the murders and the only person who can stop it is the Piranha-Man. This film could have been a great little homage to those 1950's budget monster movies much like 'THE LOST SKELETON OF CADAVRA' (2001). Where that film exceeded in what it set out to do, 'PIRANHA-MAN VS. WEREWOLF-MAN: HOWL OF THE PIRANHA' has failed spectacularly. It has so many storylines going on that you think you may have fell asleep and missed something. If this was only directed by one person then MAYBE it could be watchable but what we end up with is a mess of a film. The creatures of the film are what you would expect, no thrills monster masks and gloves. What about the clash of these two titans? Their battle is mediocre at best and is more like a sibling fight for the T.V. remote. The film is 70 minutes long and that final minute will be your only saving grace.